Retired Grace Brethren pastor Gerald Polman was giving tours of the Reneker Museum of Winona History in the historic Westminster Hall in Winona Lake, IN, a few months ago, as he does every Thursday afternoon from noon to 5 p.m.
“Do you recognize this young man at the pulpit?” he asked, pointing to a photo of a young Billy Graham preaching on the stage of the Billy Sunday Tabernacle in 1945 at the first international conference of Youth For Christ. “Yes – he’s my dad!” exclaimed the tourist. To his surprise, Polman had been explaining Winona history to Ruth Graham, the third child of Ruth and Billy Graham. She was in Winona for the filming of some women’s ministry activities with actress and model Jennifer O’Neill. “She was quite interested and quite courteous,” says Polman, who believes this was the first time Ruth Graham had visited the historical site. She knew many of her father’s associates who were in the photographs of the founding of YFC at Winona Lake in 1944, and of other friends and associates of the world-famous evangelist. 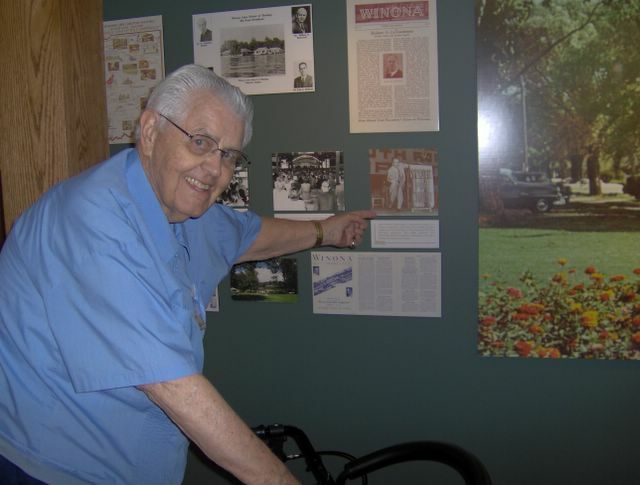 Polman, who lives at Grace Village Retirement Community with his wife, Phyllis, has been giving tours of the museum for about three years. Having graduated from Grace in 1946, he has first-hand acquaintance with some of the personalities and geographical features of the area. Polman explains the Great Fire of 1914, the digging of the canal in 1902 to create McDonald Island, the building of the Billy Sunday Tabernacle in 1920, and the “Biggest Day in Winona” (August 29, 1915, when there were 1,500 cars and 20,000 people in Winona Lake to hear Billy Sunday and William Jennings Bryan speak). “She was quite interested in Homer Rodeheaver,” recalls Polman, who explains that Billy Sunday’s songleader Homer Rodeheaver headed the world’s largest Christian music publisher—Rodeheaver/HallMack—from these rooms in the old Westminster Hotel. Rodeheaver’s reconstructed office is available for touring, courtesy of Bruce Howe, who owned all Rodeheaver’s belongings and donated them back to the museum when it opened. Prior to his returning to Winona, Polman pastored Grace Brethren churches in Danville, OH; Myersdale, PA; York, PA; Glendale, CA; Rialto, CA; Englewood, OH; and Lansing, MI. He then gave a number of years to work as a church-planter and interim pastor with Brethren Home Missions (now Grace Brethren North American Missions) at locations such as Fort Worth, TX; Taos, NM; Geistown, PA, and more. More information on the history of Winona Lake may be found at www.villageatwinona.com and information on Ruth Graham’s ministry is at www.ruthgrahamministries.com.